Tinker Bell tiptoes on a field of flowers. Delightfully colorful statue stands about 8 3/4-inches tall. My, you're looking lovely today, Tinker Bell! 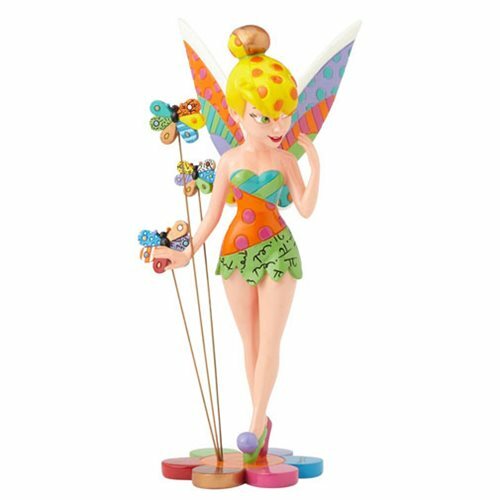 Designed by pop artist Romero Britto, Tink is surrounded by three butterfly friends as she tiptoes on a field of flowers in this delicately delightful Disney Tinker Bell Statue by Romero Britto. Made of stone resin, the ultra-colorful piece stands approximately 8 3/4-inches tall. Romero Britto is a Brazilian neo-pop artist, painter, serigrapher, and sculptor who combines elements of cubism, pop art, and graffiti painting in his work, using vibrant colors and bold patterns as a visual expression of hope and happiness. Ages 15 and up.